Chances are, IT COMES AT NIGHT isn't the horror movie you're looking for. The recurring complaint from many who caught it this past weekend is that the marketing was deceptive. That based on the trailers, they were expecting a more traditional kind of horror film. What they got instead was more of a grim drama. 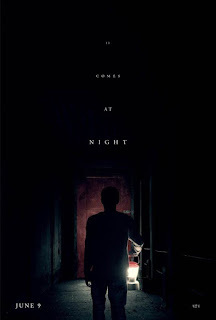 It's still a horror film, but the scares IT COMES AT NIGHT delivers are not of the fun, jump out of your seat variety. Nor do they involve much in the way of violence and gore. The kind of fear this film trades in is more thoughtful and disturbing than that. The premise is a familiar one. Some sort of plague has devastated humanity – the details are vague, but they aren't important. All we know is there's a nasty bug going around. It's lethal to humans and animals alike, and it's highly contagious. A family of survivors – married couple Paul (Joel Edgerton) and Sarah (Carmen Ejogo), and their teenage son Travis (Kelvin Harrison Jr.) – have taken shelter in their boarded up home in the woods. Sarah's father Bud (David Pendleton) has contracted the disease, and the family say their tearful goodbyes behind gas masks and protective gloves. Then Paul and Travis, along with Bud's dog Stanley, take the man outside, shoot him in the head, and burn his body. Paul handles this stoically. He is committed to protecting his wife and child at all costs, even if that means killing a sick family member so the rest can survive. Travis has a harder time dealing with this harsh reality, though, and begins having nightmares which make it hard for him to sleep. Eventually another family of survivors enters the picture – Will (Christopher Abbott), his wife Kim (Riley Keough), and their young son Andrew (Griffin Robert Faulkner). Paul, and to a lesser extent Sarah, don't completely trust them, but they decide to let the other family live with them in exchange for some of their supplies. For Travis, this new young family is something of a ray of light. Will acts as almost a less stern father figure for Travis, and Travis enjoys having the young Andrew around, almost like a little brother. His feelings about Kim are somewhat more... complicated. Despite underlying tensions, the two families manage to work together for a time. But there is always a certain amount of distrust brewing just beneath the surface, waiting for the right moment to burst out. Which, it should come as no surprise, eventually happens. Whose is at "fault" for the precipitating incident is left intentionally unclear. Either way it was an accident. Either way it has potentially grave consequences. There are no good guys or bad guys here. No "monsters". Just flawed humans trying to survive. Like the films of George Romero, it isn't so much the external "other" that presents the greatest threat, but the way scared people react to it. The other comment/criticism many have made of IT COMES AT NIGHT is that it's like an extended episode of The Walking Dead. On the surface, there are similarities. But you could just as easily compare this to THE ROAD, or, as I already have, George Romero's zombie films. Or perhaps most aptly, the hit video game The Last of Us. They're all post apocalyptic tales focusing on how humans would try to go on in such a grim reality, but each tells its story in very different ways. And while the themes may be similar, the way each deals with them is different. One doesn't have to dig very far below the surface to see what makes the tone, visual style, and themes in IT COMES AT NIGHT distinct. Notably, writer/director Trey Edward Shults is concerned not just with the ways that fear and mistrust can make people turn on one another, but how in doing what may seem right, they can lost their humanity, their souls. And the worst part is, doing so may not actually make anyone safer. It's not hard to extrapolate this theme in a broader sense to see IT COMES AT NIGHT as an allegory for the current state of our country and the world. Shults has crafted a subtle and devastating film here, every bit as good as his 2016 debut feature KRISHA (my number 4 pick for last year). As in that film, there is a sense of tension running through every scene, even when things seem outwardly calm. And once again, Shults makes good use of limited locations, although he does venture into the outside world a little more here than in his debut. There are some moments meant to intentionally throw the audience off kilter – not-always-obvious flashbacks and flash forwards, some dream sequences. And again, Shults works with cinematographer Drew Daniels, who gives the film a naturalistic feel.